Awesome. I just started working on this myself!!! Wow, that is great looking all together like that. Very impressive. Thanks for sharing those. Kaline is one of my favorite players too so it's even cooler for that reason. You should endeavor to also get autographed cards of his variations, most notably a 1962 green tint (the scan is small, so you may already have that one) and the 1973 Band-Aid card. I always loved his 55 Topps Card. So cool !! I have a number of other Kaline’s ready to send in to SGC. I have the 62 & 64 Venezuelan’s, the Atlantic Oil, 71 Topps Super, 3 Exhibits and a couple of other McCarthy Postcards and a number of more recent Jersey/Bat cards already signed. Back in the early 70’s my Dad would pick up any Kalines he could find and put together a pretty nice collection ( really happy with the Kalines but wish he would bought up the Mantle’s). I still kid him about that!! 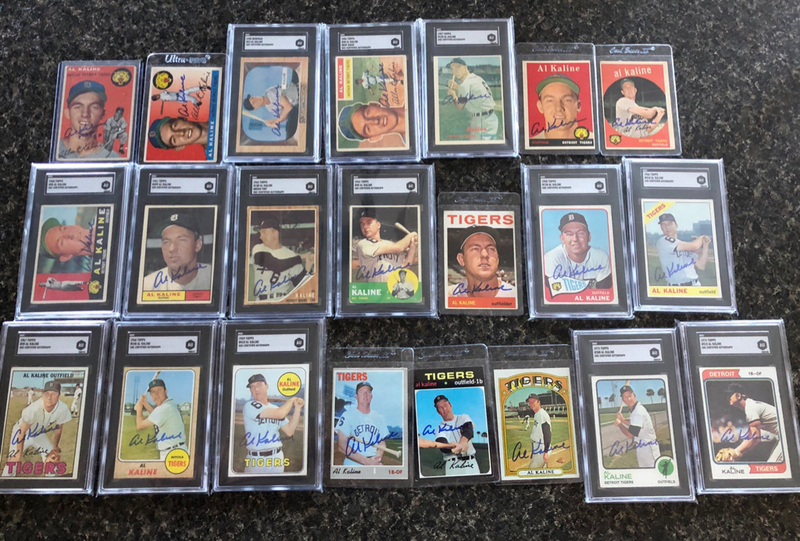 It’s amazing how many cards Kaline has and it’s quite a challenge. Thanks for the positive comments! Someone just purchased a raggedly cut but autographed 1962 Post Canadian Cereal Kaline (one of his tougher cards even without the autograph) for just $15.00 or so on ebay. I had been watching it, and decided after several days to pull the trigger despite the bad cut, but it had been sold. Anyone here get it and want to part with it for a profit? Last edited by ls7plus; 07-02-2018 at 08:11 PM. The Kaline autographed run is very cool BUT I can’t really see the cards that well in the two pictures you posted. Is there any way you could enlarge the pictures and/or take a shot of fewer cards, or even the individual cards? I started a Brooks Robinson signed run several months ago, of his regular issue cards, and am making slow progress. I’m trying to get them all in pen so it makes it a tad more challenging. I may do a sharpie autographed run once I’m complete (if that ever happens). Never was really into autographed cards in the past, but it’s growing on me. I will post them in smaller groups. I have some new ones to add as well. Give me a couple of days and I will try and post them this weekend. Also, I didn’t get the Canadian Post Cereal Kaline but wish I did. Why don’t you just send the cards to Brooks and include the pen you want. He is so accommodating. I don’t see it being a problem to get him to do that. Not trying to blow up this thread. I talked to Mike about this run and I’m working on duplicating it. Love this stuff. Got back 61/62 Kalines today! Last edited by Marchillo; 07-03-2018 at 08:43 PM. That is a great looking collection! How long did you work on putting that together? That's insane and something for other player collectors and autograph collectors to aspire to! Been working on it off and on for about 30 years. I believe I have most of the regular 1954-75 Topps cards done (still need the 1955 Double Header). I never considered the team cards until I saw Marchillo’s post on his Brooks Robinson run. I am now working on some of the odd ball stuff (Kellogg’s/SSPC/Transogram/etc). I will post more cards as time permits. Pretty excited about the Venezuelan’s. One more. 1968 Atlantic Oil. Excited to add these 2 exhibits. Al: those Kaline’s are incredible!! Just received this back from SGC. I was surprised at the size of the holder. I will post a couple of other Kaline cards that are the same size but put in a much smaller holder. A few more back today in SGC’s new holder. Anyone need a 54T Auto? How do you personally like the new SGC holders compared to the ones prior? By the pictures they look pretty nice to me. I’d personally have to get the Super posted earlier in the thread in just a tad bit smaller holder. That should go in the postcard size holder, correct? I like the holders. The only negative for me is I have probably close to 50 Kaline signatures in the old holders and these obviously don’t match for display purposes. As for the 71 Super I don’t know what the deal is with that holder. Not sure why they didn’t put it in the smaller one like the post cards. One of these days I will call and ask SGC. Overall I have no issues with SGC. They have treated me pretty well. I haven’t submitted anything to SGC, or PSA for that matter, but think for an autographed card I think the holders gives a better look for display purposes than the card alone. I’m doing a kinda side project of a regular issue autographed run of Brooks Robinson in pen, some are in holders that I purchased this way and some are just the card. Im still unsure at this point whether I want to spend the money on slabbing them or not. Also, as you noted they are in different holders, I’d likely want them all to be the same, but for you that sounds like it would be a costly proposition. Picked these up the other day. Taking them to Cleveland in a couple of weeks to have authenticated and get the auto’s graded. Awesome stuff...thanks for sharing. I'm kinda working on an SGC Killebrew base card auto run...have a few nice cards but not intense about it. Seeing these gives me an itch...lol. I too wasn't into autos but they are sure nice to own. I don’t think Brooks collects anything. He pretty much gives/gave his playing day items away. Many years ago when they wanted to get a pic of Brooks with his gold gloves they had to borrow other players GG awards so they could do the photo; he’d given most of them away. Rawlings ultimately had 16 more made and gave them to Brooks and a couple years ago they went in the Heritage auction and he donated tbe proceeds to charity. Mike have you showed Kaline your auto run of his cards? How can you not love that guy. Totally agree. wow. Thanks for the Brooks insight! Isn’t it correct that SGC isn’t going to authenticate autographs going forward? Are you going to start using PSA and/or BGS or some other company? Does Al Kaline sign through the mail or through a foundation or something? I'd love to send a card or two his way. I will probably use PSA now. I started using SGC awhile back for signed cards that I planned on keeping for my personal collection because I liked the way they looked in holders. I know many people are using Beckett as well for their signed cards. In retrospect I probably should have had PSA handle the Kaline’s and I could have put them in the registry. I started collecting his signatures in 1974 and have continued it until now. Some of the newer stuff was signed in Lakeland and have also had some success TTM. My Dad was a big Kaline fan and he helped me along the way as well. Wow. I just found this out. Finished my Kaline Base run yesterday and was gonna submit next show. Now I will have a mix. SGC has made some killer changes lately. Ugh. Thanks Mike. I’m just bummed about SGC. Looks like I’ll switch over to PSA. Thanks for your advice on this project. You were spot on.